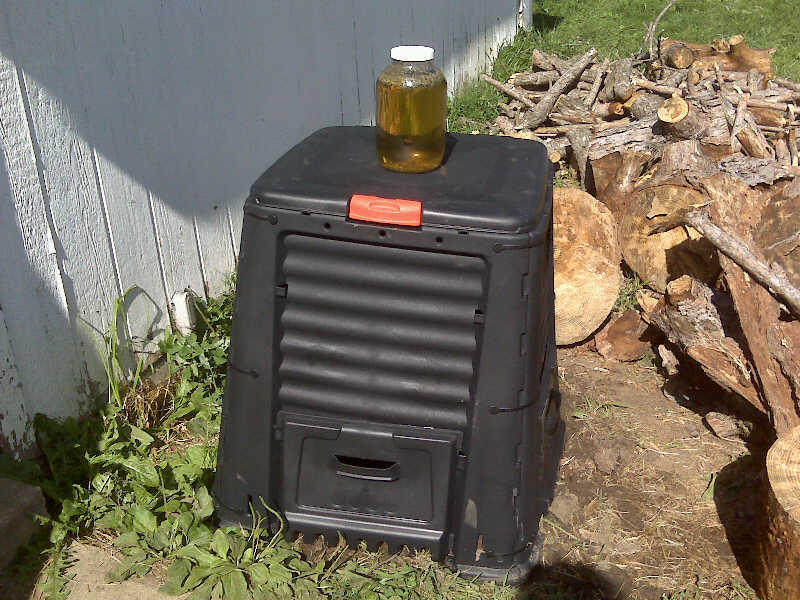 Well, we got a composter! 115 gal compster for $50 at Lowes, not a bad deal. Also I am making sun tea, that’s what’s on the top there. Sun tea says “summer” to me. 🙂 Anyone out there make sun tea? Its easy: take a glass jar, fill it with water, add either loose tea or tea bags, set in the sun. You can pretty much forget about it all day or for a couple days depending on how strong you want it. I use loose tea and when I bring it in I strain it then put it back in the same jar and put it in the fridge. We got the laundry line set up, yay! I really like hanging out clothes, its very relaxing. I don’t spend any more time on it then I would if I was using my dryer. You think it would take more time but it really dosn’t Things take a bit longer to dry then they would otherwise, but really not by much. Also I can leave them on the line as long as I want and don’t have to rush to the dryer when it beeps or risk having the clothes wrinkled, or worse: over dryed. I was talking to my dad today about line drying clothing and he said he can remember helping his mom to actually wash clothes by hand and use a wringer to wring them out. Then they would hang clothes out on the line. It hasn’t been that long that people have been using washers and dryers. I don’t think I would like to give up my washer, but I really do enjoy hanging out the clothes. We hung two green plastic/wire lines and one chain line. Its an actual chain that I got that was intended to be used to chain pets. My idea was that I could hang hangers through the loops of the chain and they wouldn’t slide along the line. It worked very well! I was able to space out the clothes like I wanted to and not have to worry about the clothes bunching up or the wind catching them and blowing the hangers off the line. I usually hang up all our shirts and my jeans so I didn’t want to be doing too much extra work here. What I did is hang up the shirts, put them on the line, and then when they are dry I can just bring them in and hang them in the closet, no extra work! I used clothes pins to hang up the jeans, towles, and socks/stuff then folded it into my laundry basket as I took it down. Easy!